It’s going to take years to complete the decor in my condominium – if I ever complete it. My timetable won’t work for everybody but it’s ok for me – decorating is a satisfying hobby activity and I enjoy doing as much as I can myself, for example even to the point of designing rubber stamps that I use to make ceramic tiles to incorporate into tile work. It’s not easy to focus on my original vision when working on such a long-term project. To help out, I have made a book to help me organize my ideas and color schemes. If you would like to make a similar book, here is what you’ll need. 1. Get some blank 8.5 x 11 paper and/or card stock and punch holes in one edge with the three hole punch. You may choose to use lined or unlined paper – the unlined is easier to draw on if you want to sketch out ideas. Open the rings and place the paper in your binder. 2. If you want to work on ideas for more than one room, make sections by placing one tab divider insert and one folder insert at the beginning of each room section. Label the section according to the room. The pockets are handy for collecting things in to mount on a page later if you’re pressed for time. 3. 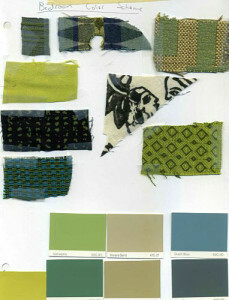 In each section, start collecting ideas and swatches that pertain to the corresponding room. Examples of things you can include are fabric swatches, paint swatches and magazine clippings with ideas or products you like. 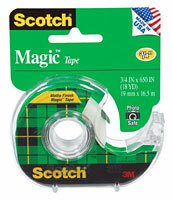 Lightweight items can be taped down to paper. 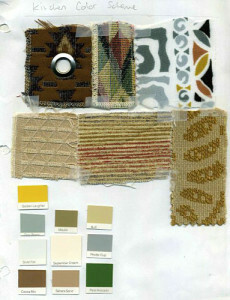 You could staple fabric swatches to cardstock and glue tile samples to chipboard or cardboard. Take notes or make sketches as you develop your ideas. You can continually add new pages as needed. 4. Eventually you may find yourself creating or purchasing things like plans, templates, instructions and stencils. If size allows these can be stored in binder folders so they are always handy or have holes punched in them to store in the binder. 5. If you’re a Pinterest user, you can create corresponding Pinterest boards to supplement your pool of ideas. From time to time it might be helpful to print out some of the pictures and instructions you find online and display them in your book. Be sure to check out Schnarr’s Pinterest offerings! If I’m designing something for a particular room, typically I’ll put the paint and fabric swatch pages up on a wall in my creative space to keep my overall scheme and feel for the room in mind as I work. I rarely require things to “match”, but I do like them to “fit”. For example my office and bedroom are heavily Mid-Century Modern, the living room is Mid-Century Modern plus Beachy, while I’m trying to give my kitchen a Santa Fe look. I don’t know what to call my in-progress bathroom – “Venice Cafe Modern” maybe, since the look I’m going for is Boho meets 1970s? Whatever you call it, putting the samples up on the wall helps remind me of what my vision is for the space.